Photo © David Seibel, used by permission. 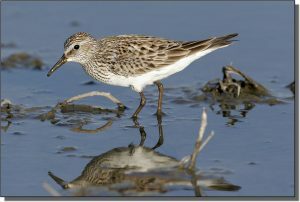 Description: This sparrow-sized sandpiper has short, black legs. The base of the lower bill is dull red but appears black in most instances. The wings extend beyond the tail when at rest. In all plumages, a noticeable supercilium, white rump and prominent black stripes and chevrons mark the breast and sides. They often forage in the vegetated edges of wetlands and in flooded fields. Similar Species: White-rumped Sandpipers can be an identification challenge. Both White-rumped and Baird’s sandpipers have wing tips which extend past the tail, which eliminates Semipalmated and Western sandpipers. Compared to Baird’s, White-rumped Sandpipers are greyer in color and have prominent superciliums. The presence of a white rump, seen in flight or when the wings are raised, is definitive. Comments: An arctic tundra nester, White-rumped Sandpipers winter on beaches and mudflats in southern South America. They arrive in the Great Plains later during spring migration than other sandpipers. A circular migration pattern, which is closer to the Atlantic Ocean on their southbound journey, makes them rare during fall migration.